CCST event will feature 12 graduate researchers and postdocs from UC, Caltech, and Stanford campuses, as part of CCST’s Science & Technology Week. 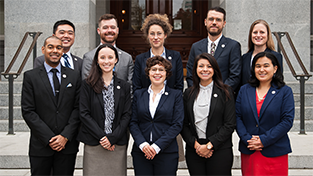 The California Council on Science and Technology (CCST) has invited 12 talented graduate students and postdoctoral researchers to the California State Capitol to practice a crucial skill: translating their research for decision makers. 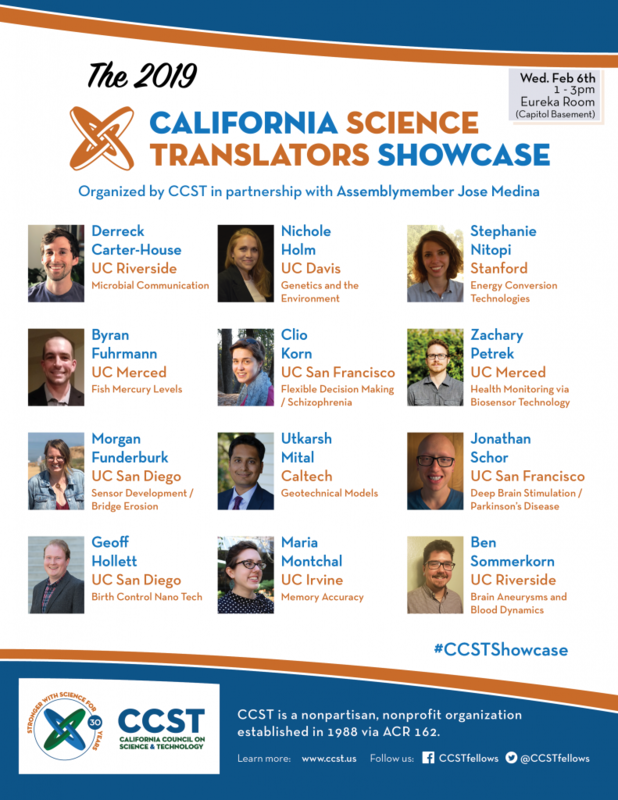 The “California Science Translators Showcase” will take place on Wednesday, February 6th, from 1:00 p.m. to 3:00 p.m. in the California State Capitol basement Eureka Room. This event is open to legislative and executive offices, as well as members of the Capitol community. Details and RSVP can be found at www.ccst.us/STWeek. 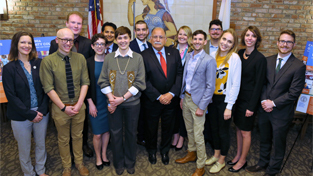 Applications were open to graduate students, postdocs, and early-career scientists from the University of California, California State University, Stanford, and Caltech campuses – all members of CCST’s network of institutional partners. Candidates were required to submit audition videos in which they had to explain the relevance of their research in less than 60 seconds; the 12 invited presenters then underwent training webinars and other exercises to prepare for the networking event. 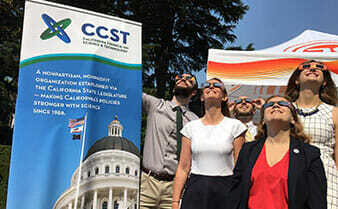 The Science Translators Showcase is one of many events during CCST’s 2019 Science & Technology Week at the California State Capitol, celebrating the role of science in service to state policy. Derreck will explain how to harness antifungals from gases produced by bacteria. Byran will explain the costs and benefits of using oxygenation in lakes and reservoirs. Morgan will explain the development of sensors to monitor erosion around bridge piers. Geoff will explain how to use nanotechnology to build better birth control. Nichole will explain the effects of genetics and aging on adult neurogenerative diseases. Clio will explain the neuroscience behind flexible thinking in health and disease. Utkarsh will explain the use of advanced geotechnical models for building resilient societies. Maria will explain how the act of remembering can affect memory accuracy. Stephanie will explain how we can recycle CO2 into useful fuels and chemicals. Zachary will explain the use of carbon nanotube biosensors for disease detection. Jonathan will explain the use of deep brain stimulation for treating Parkinson’s disease. Ben will explain the blood dynamics of brain aneurysms.